Greg Medcraft is lucky to still be the Chairman of ASIC. The eighteen-month extension to his term gives him an opportunity to fix the many problems he hasn’t done much on in his first five years. As a the graphic below from a recent review of ASIC’s capabilities shows, there’s a massive gap between what the senior management of ASIC think of its performance and what ASIC’s stakeholders think. There would be no calls for a Royal Commission into banking if ASIC were seen to have done its job. Medcraft’s infamous comments that Australia is a “bit of a paradise for white collar” crime, and the regular references to ASIC as the “corporate watchpuppy” highlight the perception issues. At the heart of the problem is that the senior management of ASIC has forgotten why it exists. The role of a financial regulator is to actively prevent and discourage misconduct by providers of financial products and services, and participants in financial markets. This role is fulfilled through law enforcement, education and ensuring equitable access to information. ASIC is not responsible for protecting investors from their own stupidity, but it is in charge of punishing those who defraud and mislead them. The ability to provide financial products and services, particularly to retail customers, is a privilege, not a right. The right to fair and honest treatment overrides any perceived rights of negligent licensees to continue to operate. It has been said that regulators should always carry a baseball bat, and occasionally swing it with lethal intent. ASIC needs to change how it is perceived from that of a “watchpuppy” to one of a feared regulator. In most instances regulators will negotiate outcomes for correcting unintentional errors and injustices. However, in cases where licensees have wilfully committed criminal activity, the punishment must be swift and punitive, that is swinging with lethal intent. These high profile cases should involve imprisonment for key individuals, termination of employment for those who knew or should have known, substantial financial penalties and cancellation of licences. For large financial institutions, penalties should be large enough that shareholders are materially impacted. This will encourage shareholders to hold company directors accountable for corporate culture, with directors, in turn, holding management accountable. As much as is possible, the potential rewards for financial crime should be substantially outweighed by the potential punishment. 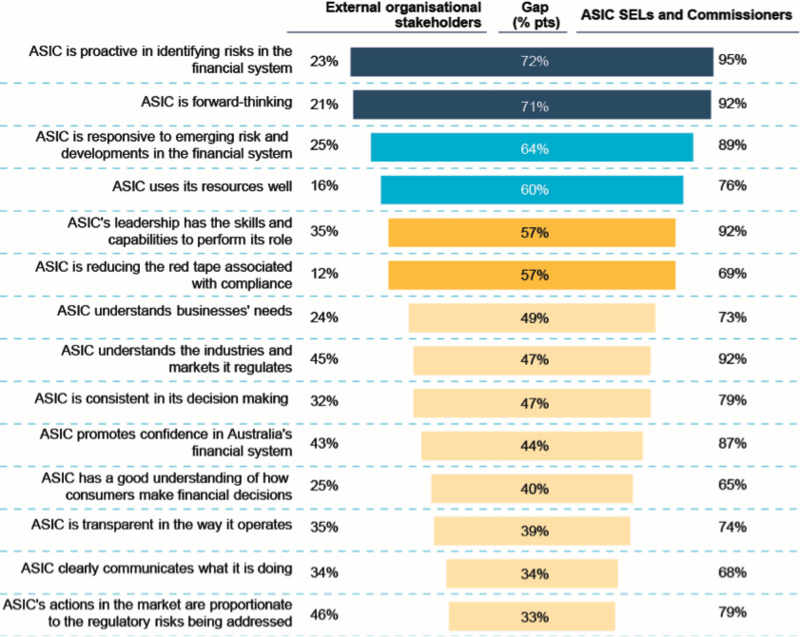 The process of changing the perception of ASIC will begin with the issues identified below. Many financial service providers have significant advantages over retail customers and investors by lieu of their size, expertise, access to information and knowledge of and access to legal remedies. ASIC has recently achieved material enforcement outcomes against individuals and smaller operators in some cases. However, it has comprehensively failed to enforce the law in the financial planning scandals at CBA and Macquarie, the endemic misconduct at IOOF and the debacle at CommInsure. ASIC has willingly allowed large financial service providers to defraud and steal from relatively vulnerable individuals. The first priority for the ASIC Chairman should be to raise substantial penalties from CBA and Macquarie for the criminal activity within their financial planning departments. Money has been obtained by fraud, signatures forged; essential records have been deliberately lost or were never created. It has been reported that thousands of customers have lost much of their life savings while the banks and employees involved have been enriched. When confronted with this criminal activity the banks have responded by stonewalling ASIC, the Senate, and the affected customers. The combination of these actions is that extraordinary penalties and restitution are justified. CBA and Macquarie should face immediate financial penalties of 25% of their annual profit. An additional penalty of 10% of profit should be suspended, with waiving of this portion contingent upon swift compensation being provided and full cooperation to ensure that the perpetrators are criminally prosecuted. ASIC should require that independent investigators are hired to assess all client dealings for the past twelve years, with the cost paid for by the banks. National advertising should be run that details the criminal behaviour that has occurred and encourages former customers with doubts to come forward to ASIC with their complaints. Affected customers should see their position restored plus a 7% per annum return for the time elapsed, as well as receiving an additional payment for the unnecessary hardship suffered and full reimbursement of their legal costs. If either bank was to contest these penalties, their licences to offer financial planning services to retail customers should be immediately revoked. (3) an expectation that their evidence will be taken seriously. (3) compliance increases as companies are aware that others are being caught and prosecuted and that their own employees have substantial incentive to report their misdeeds. ASIC has comprehensively failed to enforce insolvent trading laws and in doing so has perpetuated phoenix activities. Insolvency practitioners uniformly condemn ASIC for failing to act on their many reports that companies have traded while insolvent with creditors suffering substantial and unnecessary losses as a result. Reforms to insolvency laws could make the task of prosecuting easier, but ASIC’s failure to try to prosecute cases where creditors have obviously been defrauded is completely unacceptable. The enforcement team should immediately begin prosecuting the most egregious cases and send “please explain” letters in cases where it appears that phoenix activity has occurred. The recent 60 Minutes feature on residential lending shows that banks are taking a narrow view of responsible lending. A young couple was able to borrow $6.5 million based primarily on the rent earned from properties located in mining towns. Lateline reported that banks are forging loan applications to make borrowers appear to be able to repay loans that they obviously can’t afford. ASIC should be providing additional clarity to residential mortgage lenders on grey areas and no-go areas. This would include taking into account the potential for borrowers to be unemployed, to retire, take extended leave for health issues or childcare responsibilities and the potential for an economic downturn to occur. Payday and online lenders continue to provide high-cost loans to consumers who already have substantial existing loans. Financial hardship is being exacerbated rather than relieved as the high-interest rates and establishment fees are trapping consumers in debt spirals. The evidence of problems is rife, the action from ASIC has been limited. Large financial penalties and cancellation of licences are required to rectify this problem. In situations where egregious offences have occurred, licensees often seek to avoid responsibility by putting their companies into administration. The ability to raise penalties against the companies is therefore not available. In these cases, personal penalties backed up by the possibility of personal bankruptcy is required. In some cases, the maximum financial penalties available are insufficient to match the severity of the offences. ASIC should undertake a review of all white collar penalties and make direct and clear recommendations to the Federal Government on where these penalties should be increased. This is likely to require an education process with parliamentarians, explaining why white collar crime should be taken seriously noting the personal impact of financial crimes. ASIC needs to recognise that both of these criticisms point to a worsening of the competitive imbalance in the provision of financial services. As the financial planning scandals at CBA and Macquarie have shown large firms can create enormous workloads for ASIC. Capping fees is inappropriate and unjust; the regulatory cost burden should be shared on more equitable measures such as the number of staff employed. A multiplying factor (for instance 2 – 10 times) should be applied to licensees who have committed misconduct within the previous five years as they will require higher levels of supervision. Non-institutional investors cannot be expected to understand obscure documents and products. The onus must be on providers to be clear and concise in describing the potential risks involved. While ASIC has taken some steps to ensure that comprehensive disclosure documents are provided, these documents are often long and written in technical language. The vast majority of investors read little or none of these documents. The solution is to require that lengthy documents provide one or two-page summaries in plain English at the beginning of the document. ASIC would be responsible for approving these summaries, allowing it to set high standards for simple, truthful and balanced disclosure. If this can’t be provided the investment is arguably too complex for retail investors and sales of that investment product should be restricted to wholesale investors. As highlighted by the Financial System Inquiry, it is unclear to many consumers when they are receiving conflicted advice. Financial advisors are in some cases required to disclose commissions and bonuses, or the potential to receive financial rewards as part of their sales process. However, this disclosure is not uniformly required or provided. ASIC currently maintains a register of banned and disqualified persons. People who are named on this list may be subject to temporary or permanent bans on their employment in the financial services industry. To the extent legally possible, additions to this list should be permanent. Known offenders should be barred from ever working in financial services again to protect customers and investors from people proven to be untrustworthy. If legally possible ASIC should also create an “unsuitable persons” register. These would be people who ASIC considers unsuitable to work in the financial services industry but who are not legally barred from doing so. People who have previously been on the banned and disqualified register and those whose have committed substantial misconduct would be recorded on this list. Licensees would be required to report each year as part of their license review how many of their employees are on this list and the measures taken to monitor the conduct of those employees. Greg Medcraft is lucky to have had his term extended given the performance of ASIC in his first five years. While ASIC has recently had success in prosecuting insider trading and some small financial services providers; the perception is that it is neither respected nor feared by those it regulates. His to-do list should begin with issuing large fines to the major banks for known criminal activity, restitution for individuals defrauded by them and the establishment of proper whistleblower protections and rewards. Publicly dealing with the largest misconduct cases will begin ASIC on the long journey to becoming a respected and feared regulator.